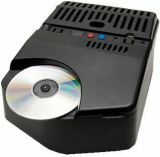 Simple and low cost machine to destroy data on CD/ DVD. Grinds away the data layer, leaving only the clear polycarbonate disc. It offers secure data destruction at an affordable price.